Hi, I’m Biz from Bizzy Crochet! I started crocheting at the feet of my Grandmother at the age of 8. I think it was over an Easter or Christmas break. 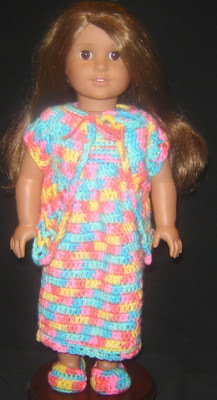 I went home from that visit and feverishly used all of my Mother’s scrap wool to make some very, very ugly Barbie clothes. I look at them now and they are unrecognizable as clothing. But back when I was 8, they were brilliant and the designer in me was born. Even though she would lay dormant for many years! Designing became a major part of my life when my son wanted to have a Pokemon themed birthday party. I refused to pay $6/toy for his friends to have a plushie in their favor bag. So, I decided that I would just make them. 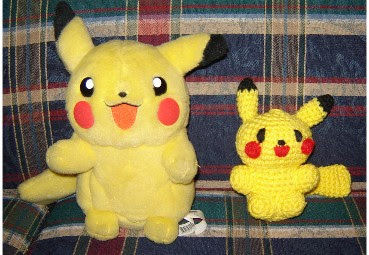 I looked at the little plushie toys that he owned and came up with a crocheted version. 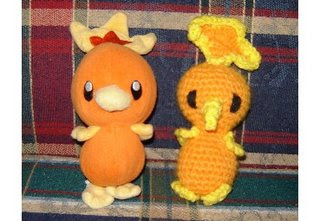 Torchic and Pikachu were some of my first designs. My daughter got in on the action and decided that her American Girl dolls need some new clothes, so I set to designing some patterns for her. 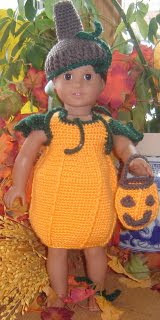 Some of my favorite designs are the Nightie, Robe and Slippers set and the Pumpkin Costume. I have had people ask me how I got into designing toys for babies and toddlers, especially my heirloom toy bags. I started because I was in a toy swap on Crochetville and there wasn’t a single spaceship, astronaut, or rocket crochet design to be had. I decided I would go ahead and “whip something together” for the little boy of my swap partner. 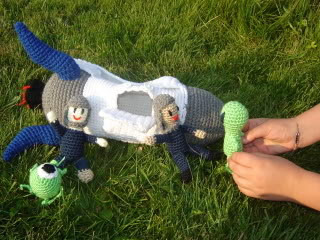 Lo and behold, the Rocket Ship with Astronauts and Aliens was a big hit! I decided to share the pattern for free online and I got an overwhelming response to it. For my niece and nephew I designed more toy bags as Christmas presents. One of them was my Fantasy Castle toy bag. My kids have always been, and still are, my inspiration for designing. Every once in a while, when I feel my creative juices running dry, I will pull out the big notebook of ideas and we will all sit around and brainstorm new designs. Some of them are totally ridiculous, but many of them are wonderful! 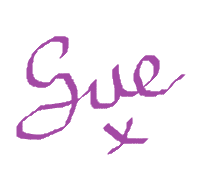 You can thank my children for the toy designs that I have published for you to use. Even though they are now 17 and 16, they get just as much joy out of every toy I create as your little ones do. Every toy is examined by their eyes and played with by their hands and named with their love. I have branched out in several different directions with my designing. Really, there is no rhyme or reason to what I make. It’s really all about what tweaks my interest at the time. Lately, I have been on a hat designing binge. 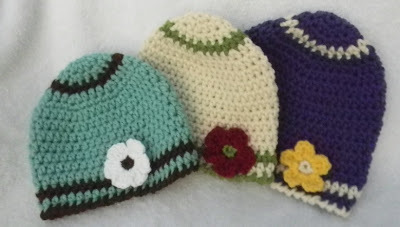 My latest baby hat design is called the Zen Baby Hat. Before I go, I would like to share this one last pattern with you, and I hope that you stop by Bizzy Crochet and say hi! 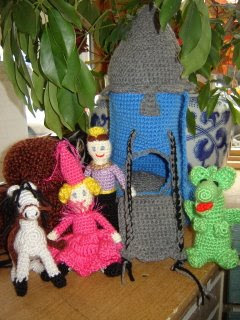 Also, come visit me on my Bizzy Crochet Facebook Page. I am always posting links to interesting and free patterns. It is my passion to spread the love of crochet (and all things yarn) as freely as possible! I am also getting ready to celebrate reaching 1,000 likes on my Facebook page with a Giveaway for a lovely, crocheted, ruffle purse made by me! I am bizzyboppers on Ravelry and originalbiz on Etsy! 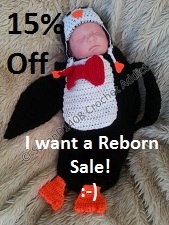 Huge 15% #Sale on #Crochet Patterns.